OTTAWA, Ont. – Results of Canada’s 2016 International Roadcheck were released this week and according to the numbers, in Canada, nearly 82% of commercial vehicles inspected this year passed CVSA’s on-road inspection criteria. The three-day blitz took place June 7-9, 2016 across Canada, the United States and Mexico. In Canada alone, inspections were carried out at random at 146 sites across the country. In total this year, 1,698 commercial vehicle enforcement officers conducted more than 8,100 Level 1 inspections (the most thorough of the on-road inspections). Results show that 7,736 of the trucks, trailers and passenger carrying vehicles were issued new decals to show they met the highest degree of safety and mechanical fitness according to CVSA. In total, 1,480 trucks were placed out of service during this year’s Roadcheck in Canada. Close to half (46%) of those placed out of service were due to brake system defects and brake adjustment issues. CVSA said that despite the efforts placed on brake-related defects, it continues to be the number one issue during roadside inspections. In addition, just 2% of drivers were placed out of service for logbook, driver qualification or paperwork problems. Broken down by province/territory, Alberta had the highest out-of-service average across Canada. In Alberta this year, 463 trucks were inspected during Roadcheck and 167 were placed out of service, bringing their OOS average to 36.1%, well above the national average. On the flip side, New Brunswick had the lowest out-of-service average in Canada. In New Brunswick, 241 vehicles were inspected and just 28 were placed out of service, meaning they had an average of just 11.6%. Ontario had the highest number of vehicles inspected during Roadcheck with 3,397 truck inspections completed. Of those, 530 were placed out of service, bringing the Ontario OOS average to 15.6%. 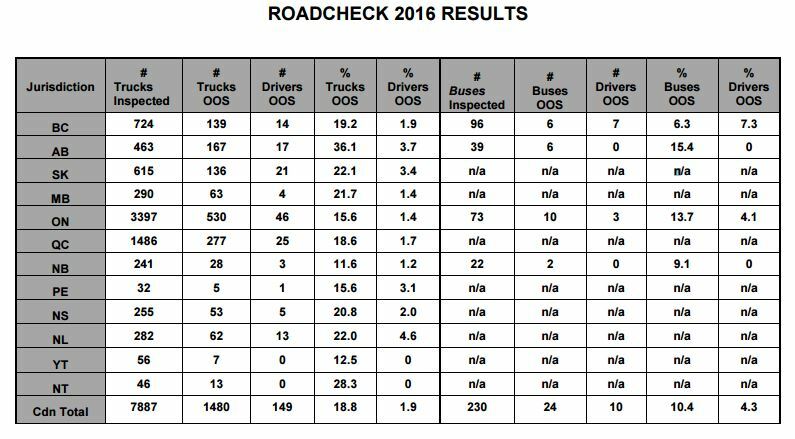 In total, the national truck OOS average for this year’s blitz was 18.8%, the same as 2015 results. CVSA said that US results of Roadcheck are expected to be released in early September. Alberta transportation has evolved faster and the fact of having new companies coming out of the woodwork by introducing aliens behind the wheel that don’t know anything about safety since there was none in the country they came from. Hope DOT will do more check up in the near future.